It's Spargelzeit in Germany and everyone is going asparagus bonkers! 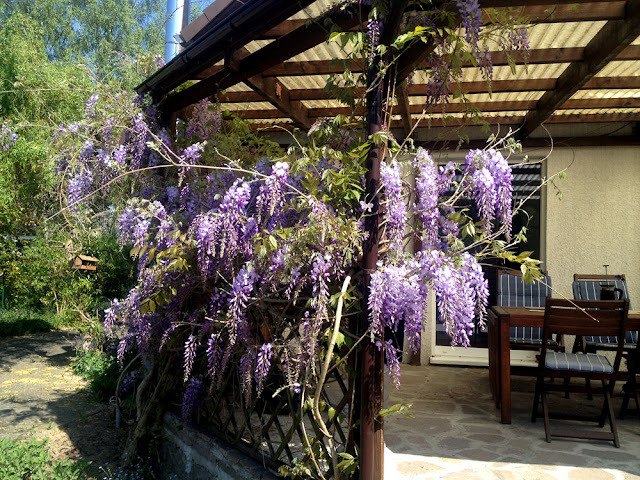 For a few weeks during much of May and early June there is hardly a lay-by or car park where a wooden cabin selling bundles of asparagus hasn't sprung up. Their stalls are mostly laden with chunky white spears of forced white or violet asparagus, but you can also get the more delicate (and tastier in my opinion) green asparagus too. The better planned outlets will also sell you eggs to make hollandaise sauce, and Spargelkartoffeln (potatoes to have with asparagus) which I didn't even realise was a thing. After you've nibbled your way through heaps of lush, green asparagus, par-boiled and dripping with butter, it is inevitable that you will want to try out different ways to consume asparagus before the short season is over. 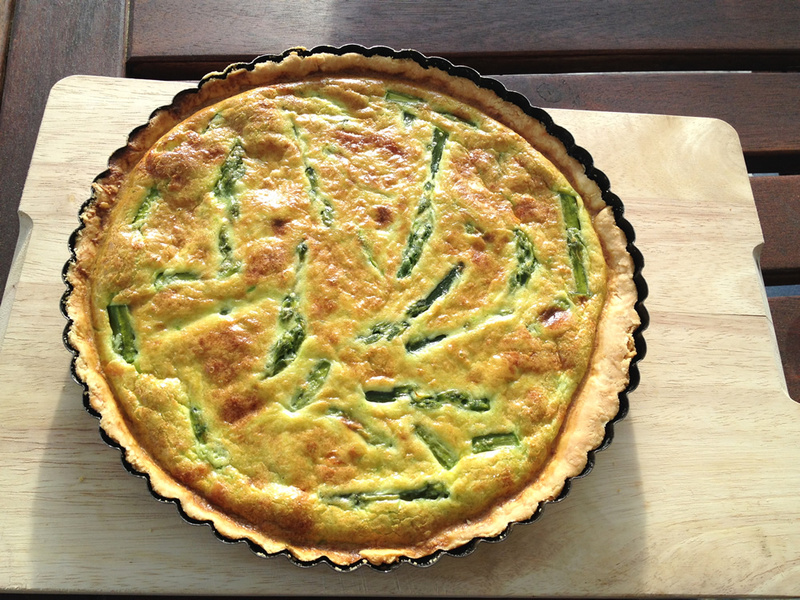 There are lots of recipes, but one of my favorites is to make an asparagus tart, which I shall share with you now. For the pastry, I start with a basic shortcrust. For that, start by weighing out 225g of standard flour (Weizennmehl, type 405) and a good pinch of salt into a mixing bowl. I'm going metric here, but in my head I'm thinking 8:2:2, or 8oz flour, 2oz hard fat, 2oz margarine. Actually, I want a really short and crumbly pastry, so I am being indulgent and using butter as my hard fat instead of white vegetable fat or lard. So, into my bowl I add 50g of diced butter, and 50g of margarine. I then rub the fat into the flour until the mixture resembles breadcrumbs. The secret here is to work the mixture as gently as possible, so use the tips of your fingers only, and run cold water over your hands beforehand to keep the fat from melting too much. To the flour/fat/salt mixture I next add a couple of tablespoons of ice-cold water, then gently stir it in with a spatula. If the mixture doesn't start coming together into a dough, then you might need to sprinkle on a little bit more water, but you definitely don't want it to get too soggy and squelchy or it will burst apart in the oven as the water expands as steam. When the pastry dough has started to come together, I turn it out onto a flour-dusted surface and press it together into a ball. Then I wrap it in a sheet of cling-film to stop the dough drying out, and pop it into the fridge to chill for at least half an hour. After a bit of chilling out time, I warm the oven up to a moderate heat - 180 degrees C is fine. Now I flatten the pastry dough into a disk on a floured work-surface and begin to roll it out with a wooden rolling-pin. I find if I start the process whilst the pastry is still in the cling-film then it lessens the stress and handling of the pastry. Then I unwrap the pastry, and finish off with a rolling-pin (actually a 1 inch wooden dowel I got from the DIY store) until I have a large, thin circle of unbroken pastry large enough to lay into a lightly-greased, round flan tin with removable bottom. I then lay the pastry into the flan tin, and press it down, leaving an excess of pastry overhanging the edge. The extra width will stop the pastry shrinking into the tin whilst it bakes. I prick the pastry with a fork, then cover with a sheet of baking paper, fill with ceramic baking beans, and slide it into the oven on a tray. It now bakes for fifteen minutes until a light golden brown, when I next take off the paper and beans and bake for a further five minutes. Meanwhile, on with the filling. I take about 400g of asparagus spears, break off and discard the woody stems at the bottom, wash them, then place them in a large frying pan with a lid that is half-filled with boiling water and gently bubbling over a low heat. The spears are steamed for about four minutes until they have gone a bright green and are starting to go limp. Then I whip them out and plunge them into a bowl of ice-cold water to stop them cooking further and retain their colour. I then slice the spears up into one-inch (2.5cm) sections, making sure I keep the delicate tips separate. Next I take about half of the asparagus, but none of the tips, and puree them with a hand blender. In a separate bowl I crack in three large eggs and beat them up with a whisk. To the eggs I add a carton of cream or Schlagsahne (about 284ml) and 50g of a grated strong hard cheese such as Emmental, or preferably English cheddar if I can get it. I add a twist of pepper and a pinch of salt, then introduce the pureed asparagus and whisk it all together. By now, the pastry case will be baked. The overlap of pastry needs to be trimmed, easiest done by rolling the rolling-pin over the top of the flan tin and letting the tin itself cut through the pastry. Tidy off with a knife. I evenly spread about half the remaining asparagus (still not the tips) onto the base of the flan case, pour on the eggy, cheesy, asparagus custard, then arrange the rest of the asparagus (tips!) onto the top of the mixture. The flan is returned to the oven and baked for about 35-40 minutes until set and with a dark, golden top. We will be impatient to eat the flan as soon as it is done, but it is best left to cool slightly, and can be eaten cold as well if preferred on a hot Summer's day. Push out of the flan case and serve with a salad or whatever takes your fancy. Or even with salty, buttered Spargelkartoffeln sprinkled with chopped parsley. 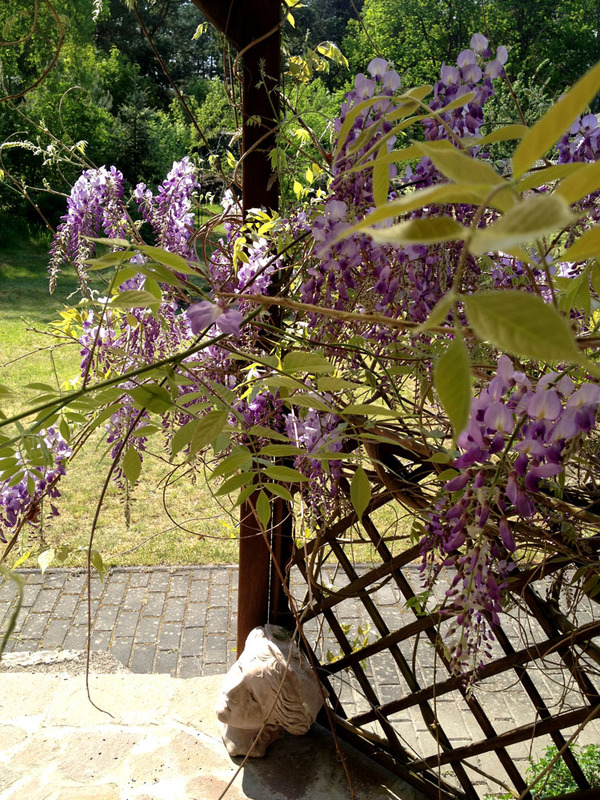 The wisteria on our terrace is looking particularly spectacular this year, and smells divine! In German it is called Blauregen, or 'blue rain', which is a wonderful description, except ours is more Purple Rain. (RIP Prince, you were unique! ).